When you hand someone your business card, you are immediately making an impression on them. Your card should represent you and your business, and you want to display a professional image. You want your customer to be comfortable in knowing that your company is a company worth using! To do so, you need business cards that are printed with superb ink quality and on a high quality material. With Nu-Miracle Press printing your business cards, you can make the first impression that you need. It takes a certain type of design to catch the attention of potential clients. Our team specializes in creating designs with that special flair that will set your business cards apart and prevent you from just being tossed with the rest. 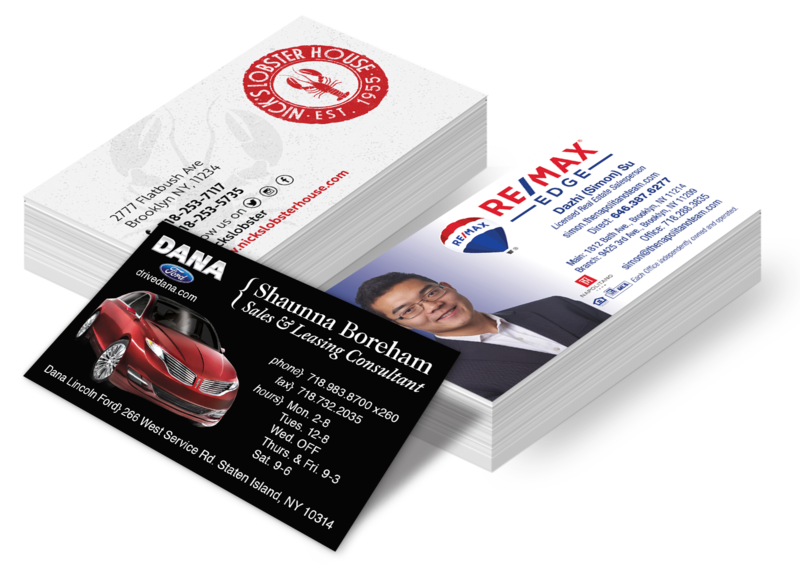 Please feel free to stop by our office, located in Brooklyn, to see thousands of samples of business cards that we have created. You can browse our previous designs until you find one that inspires you, and then we can work with you to make this design truly unique to you and your business. Handing out a premium and thick business card, no on will forget you or your company. When it comes to your business all the small details matter, and making an impression is just one of them. If a customer knows that you are willing to put the effort into small details for yourself, they know that you will take the time to focus on the details for them. This builds trust and lets them know you understand the big picture. A professional business card is the first step in branding your company by showing your desire to stand out and be unique. Standing out sets you apart from competitors who offer similar services but don’t have the same approach that you do. No one will choose a boring old black and white card over your premium designed, full color – custom designed business card. Did you know we can do next day printing on 12pt color business cards? That’s right, you can place an order for business cards and pick them up the next day. We are that fast.